All the books have been packed up and shipped out. It was really lovely to have them all in my hands. Everyone, they are just beautiful and I’m so proud to be a part of such a talented group. Your work enriched and inspired our library goers. I realize it’s a bit late now, but I redid my cover and FINALLY added the back to my book. If you want to know the honest truth about my motivation for setting up the Flying Pictures Project, I have to admit it was jealously. 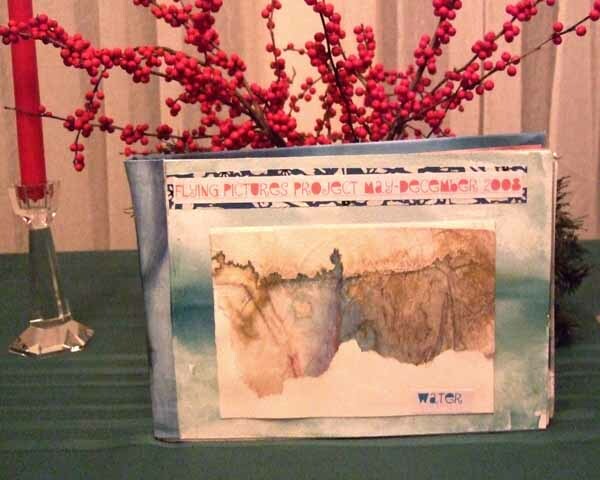 Early in 2008, lots of traveling art journal projects popped up in the art blogsphere. Everyone was buzzing about these tiny little Italian Moleskin journals that were passed from artist to artist. They were having so much fun and I felt left out. No one had asked me to join an of these groups. After feeling sorry for myself for awhile, I decided to start my own project. The Flying Pictures Project was a special time in our lives. All us had numerous responsibilities, life changes and periods of artistic blockage. Some of us had health issues to deal with, busy jobs, summer travel plans, family obligations … But through it all, we became friends laughed a great deal and grew creatively from each other as we worked on this project. I initially asked 3 women to join and they in tern asked others and when the dust settled we were 7 enthusiastic women on 2 continents dedicated to making the project work group. These were women whose art I had admired for years as a blogger. And now I was going to get to know them better and have a book filled with their art. Although the initial project idea was mine, I did not have any specific plan on how to make the project work…the nuts and bolts. (This is my preferred way to work creatively too…jump head first with lots of enthusiasm and then figure out later how to swim!) I felt my job was to initiate the project then serve as a sort of project manager…I would regularly write up notes to everyone clarifying and reiterating the details and commitments everyone had discussed. It took about a month for us to work out all the details. At the start, we used regular emailing to communicate and quickly discovered that having an email box stuffed with correspondence, no matter how funny, was overwhelming! Being the only North American well outside the time zone of the continent, I’ often wake up in the morning with 20 emails stuffed in my box. My friends on the continent had been debating issues while I slept the night away. The first and most important issue at hand was choosing a journal format. We knew we wanted them all to be roughly the same size but for artists, the issue of materials is huge one. There is a dizzying array of sketchbooks to choose from and artist’s fall in love with particular ones. Artist’s can rhapsodize endlessly (boring our loved ones to tears) about favorite papers, pen, pigments and other materials. We all had strong opinions about materials…. You get the picture here….collective mind smacks into personal desires. When the group started in the spring of 2008, I was enrolled in an Artist’s book making class at Columbia Colleges’ Book and Paper Arts Center. My teacher Jen Thomas taught us not only the basic book forms but encouraged us make conceptual art books. With this in mind, I suggested to the group that we build our own journals and I’d promised to post a tutorial for the concertina format (a fairly simple form) on my blog. Anybody golf? Cook? Fish? Anyone in law enforcement? Then you know how attached people are to their tools. Vivien stepped in with a brilliant solution. She suggested that we each construct the cover and first few pages of the books but the rest of the pages could be attached as the books were passed around That way, each artist could use her favorite paper and materials, make the pages and attach them in someone’s book only if they pleased her. Big sighs, huge collective relief… Everyone loved this idea. Making our own journals and building them as they went around made our project unique among all the other traveling journals going around. Now that the Book and Paper issues and communication issues were settled, we still needed a blog for the project. Casey sprang into action setting us up on a Word Press blog platform. She and her son collaborated on the creation of our blog banner. One person threw out journals from the second story of their home while the other photographed the “flying books” from below. Great banner, no? We were all impressed and delighted with our project blog. We were all set to launch our project. We all agreed to send the books out by the end of May. Robyn pleaded with me to make sure the outside wrapper was nice and boring. She was very concerned about the Italian customs process and wanted the package to look as innocent as possible. In fact, we all worried about the international post…but that worked out very well…knock wood, we haven’t lost a book yet. Sprinkled throughout all the participants’ descriptions of the project are words that express both excitement and trepidation as we opened the long awaited packages sitting on our door steps. The books were like jewels; each page a delight, each cover to be savored and yet, also cause for knocking back couple of aspirins or quantities of chocolate to quell the sudden and overwhelming headache. Surprisingly this fear is common even among hot shot artists who are paid thousands of dollars for a painting. Kurt Jackson, a famous landscape artist in the UK has expressed similar doubts about his painting skills on a You tube video as he starts a plein air painting. Establishing trust among the participants early in the process allowed us to talk frankly about this issue and use it as a way to strengthen our friendships and laugh our way through these silly fears. We cheered each other on, told jokes, sent chocolate and more chocolate, small gifts and shared one of life’s most valuable gifts: friendship. The project also helped us grow as artists’ Nina’s says “ Every time a book landed in my mail box, my heart raced a bit – it was so much fun to unpack and look through the books. And each book that arrived was longer than the last one because it had passed one more participant. It was such a great feeling to see everyone’s work in real life, to be able to share our art even though we live in different parts of the world. I looked very closely at everyone’s contributions, and couldn’t get enough of seeing how everyone worked, what paper they choose, what techniques and tools they preferred. I would urge anyone who enjoys our books to start one of there own. It’s not about being a great artist it is about opening ones eyes and taking the time to meditate about the wonder of our world. What you make not of will provide a record not only for when your own memories dim, but for future members of your family to see life through your eyes. The Project gave me so much more than I ever expected. and I now feel a world-shrinking sensation when I think of how many friends I have all over Europe. We all hope to one day meet each other in person. Collect favorite words, poems, quotations, lyrics, signs, slogans, music, composers, films, books, images drawn or collected from magazines, photographs, descriptions of things or experiences, tastes and smells, encyclopedia entries, and newspaper headlines, ticket stubs, cards, favorite emails, We are steeped in a visual culture that streams by us every day. Whatever snags your attention can be the raw material for creating a journal. I encourage you to invite your family, your friends or your colleagues to play along and have some fun of your own creating a visual journal. At this point in the talk, I invited the participants to come take a look at our books up close and this was the best part of the evening. Thank you all my fellow Flyers! May we inspire many more groups to try what we did? Here is Nina’s completed book. Note the pride of place her book has in her living room! Thanks Nina, this will be a nice addition to the program. Here is our display at the Oak Park Public Library. Please note the space set up for Vivien’s book as soon as it arrives. (Fingers crossed tightly) I’ll up date the photo when her book is in the case. Please note the optimistic title “First Reunion”. Let’s hope the second reunion of the books is with their owners! Glen’s book complete’s our formation of 7 slide shows. Check out her fancy back cover! (Yours truly has yet to make and attach her back…I better get moving! Tomorrow, I’m going over to the library to set up our case. I’ll have to rotate the books throughout the month due to the size of the case. I’m also showing some commercially published sketchbooks with ours to round out the display. If anyone else wants to send me copy to read on the night of November 12th, please drop me an email! Sorry for some of the wonky crops. Author lindsay816Posted on October 31, 2009 October 31, 2009 Categories Uncategorized5 Comments on Glen’s Book, At Last! Robyn, how I wish you were here to photograph all of these. Wish this photo was in your back yard in Italy! In the Spring of 2008, I invited three web friends in distant countries to help me plan a traveling artist’s journal project. Our group eventually became seven artists on three continents united in our desire to have fun and exchange art and we launched The Flying Pictures Project Now the project journals ( unfortunately not the participants) will be united for a display at the Oak Park Public Library. I’ll be speaking about our process, fun and art work Thursday evening November 12 at 7PM at the Oak Park Public Library. The books will be on display at the library for one month and you will be able to see them up close in person on the night I’m speaking. I wish all of the Flyers were going to be there with me to speak….sigh. Some day! I’ll also discuss how anyone can start a journeling project and demonstrate how to make a simple pamphlet journal. With very simple tools and daily paper ephemera anyone, even people without art training, can create a rich, satisfying visual journal. In another week or so, I’ll post a tutorial on how to make a pamphlet stitched journal with simple materials. I’m so excited to have five of our journals in my hands. They are so beautiful in person. After all those rotations of books, I can know exactly which person made which art work. That’s how each of our unique voices shines through the pages of these special journals. My Flying Pictures sketchbook is now on its way back to Lindsay for her exhibition.